Bradbury (b. 1920) is one of my favorite writers. He brilliantly slips in, out, through, and between science fiction, horror, fantasy, and straight literary writing in almost all of his work. He’s particularly deft at inserting macbre scares and psychological horrors into stories that also flow with symbolism and emotional depth. 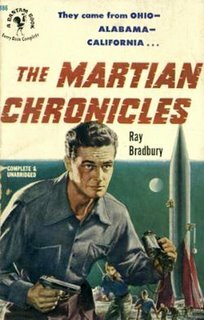 Although his novels are fantastic, Bradbury’s strong suit, as with many sf writers of his generation, is the short-story format. 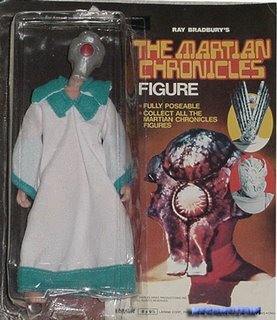 And that’s why The Martian Chronicles is so good. In this novel/short story collection hybrid, Bradbury strings together a series of narratives connected limitedly by characters, themes, and chronology. On the face of it, they’re all stories about the colonization of Mars. But like most Bradbury stories, they speak much more about the present–at least the present that was the late 40s/early 50s: nuclear paranoia, racial tensions, late colonialism/early postcolonialism, Midwestern idyllism, the rise of suburban living, and a gnawing sense of loneliness. I find it a pleasure to read every time I pick it up. “The Earth Men”: When the second expedition lands on Mars, the native Martians find the human astronauts crazy and put them in a mental institution. “The Third Expedition”: The third Earth party finds Mars populated by humans from the 1920s, including several dead family members and friends. As they reunite with their lost loved ones, the captain spends a sleepless night next to his formerly dead brother pondering the best way to execute a sneak attack on foreign invaders. Wouldn’t…really take them by surprise? Still makes my skin crawl. “Night Meeting”: A human and a Martian from the past (maybe?) meet at the crossroads of space and time. Whose perception of the “present” and “truth” is most valid? Does it matter? “Way in the Middle of the Air”: All the black folk in a southern town board rockets for Mars to flee Jim Crow. A sole white taskmaster tries to stop them. “There Will Come Soft Rains”: Probably one of the most famous and popular science-fiction stories ever. A self-sufficient house continues its daily chores after its inhabitants are vaporized in the explosion of an atom bomb. “The Million-Year Picnic”: The last refugees of war-torn Earth meet the next generation of Martians. This entry was posted in 100 list, favorite things, pop culture, Reviews, social sf. Bookmark the permalink.